Biryani is a traditional mixed rice dish from India. Made with fragrant spices and tender chicken, this dish takes several steps to assemble, but the result is well worth the effort. 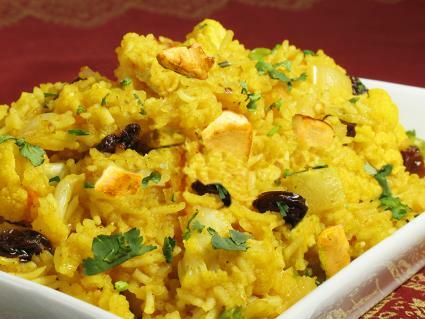 Chicken biryani has several major components including onions, chicken, rice, and spices. The dish features warm spices like cardamom, turmeric, and cinnamon, layered with sweet fried onions and fragrant basmati rice. In a large bowl, cover the rice with water and soak it for 30 minutes. Drain the rice in a fine-mesh sieve. In a saucepan, bring the 2 1/2 cups of water to a boil. Add the basmati rice. Cover and cook for 15 minutes. Remove from heat and set aside. While the rice cooks, in a large pot, heat the ghee on medium. Add the onions and cook, stirring occasionally, until they are golden, about 10 minutes. Add the ginger and garlic to the onions and cook, stirring constantly, until they are fragrant, 30 seconds to one minute. Add the chili powder, cloves, cardamom, pepper, cumin, curry powder, garam masala, coriander, cinnamon, turmeric, salt, yogurt, and tomatoes. Cook, stirring frequently, until the moisture has evaporated, five to seven minutes. Add the raisins, chicken, and jalapeños. Cover, and cook, stirring occasionally, until the chicken is done, about 15 minutes. Add water as needed to keep the mixture moist. Mix the saffron with 1/2 cup of hot water. Remove the cardamom pods, whole cloves, and cinnamon stick. In a 9x13 baking dish, put the cooked rice in a single layer along the bottom. Cover with the chicken mixture. Sprinkle with the saffron and hot water. Bake for 20 minutes. Garnish with parsley or as desired. You can also make biryani in a slow cooker. In a large slow cooker, mix the chicken, raisins, onion, garlic, ginger, chili powder, cloves, cardamom, peppercorns, cumin, curry powder, garam masala, coriander, cinnamon stick, tumeric, tomatoes, yogurt, and jalapeño. Cover and cook on low for seven hours. Boil the rice in hot water for 15 minutes. Remove the cardamom pods, whole cloves, and cinnamon stick from the slow cooker before serving. Mix the saffron with 1/2 cup of hot water. Stir it into the rice, along with the chopped cilantro. Layer the chicken mixture over the rice. Biryani can be made with all types of meat, or it can be vegetarian. Common meats used include chicken, lamb, and goat. Some recipes also call for potatoes. Vegetarian versions may include cauliflower, broccoli, carrots, sweet potatoes, and other vegetables. Biryani is a traditional wedding meal in Bangladesh. There are a number of varieties of the dish based on the region in which it is prepared. With its mix of heady spices and tender meat, chicken biryani is a delicious dish to prepare. Try it for a family dinner with a carrot and bell pepper salad for a tasty family dinner.